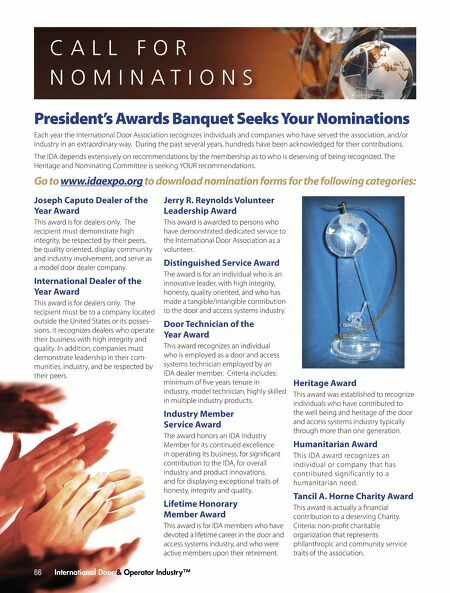 CALL FOR NOMINATIONS President's Awards Banquet Seeks Your Nominations Go to www.idaexpo.org to download nomination forms for the following categories: Each year the International Door Association recognizes individuals and companies who have served the association, and/or industry in an extraordinary way. During the past several years, hundreds have been acknowledged for their contributions. 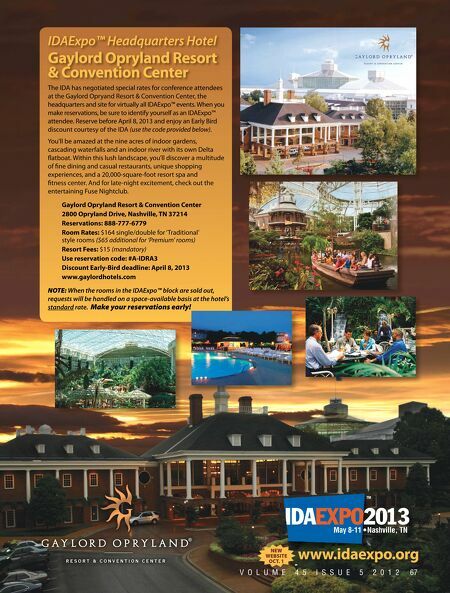 The IDA depends extensively on recommendations by the membership as to who is deserving of being recognized. The Heritage and Nominating Committee is seeking YOUR recommendations. +PTFQI $BQVUP %FBMFS PG UIF :FBS "XBSE This award is for dealers only. The recipient must demonstrate high integrity, be respected by their peers, be quality oriented, display community and industry involvement, and serve as a model door dealer company. *OUFSOBUJPOBM %FBMFS PG UIF :FBS "XBSE This award is for dealers only. The recipient must be to a company located outside the United States or its posses- sions. It recognizes dealers who operate their business with high integrity and quality. In addition, companies must demonstrate leadership in their com- munities, industry, and be respected by their peers. +FSSZ 3 3FZOPMET 7PMVOUFFS -FBEFSTIJQ "XBSE This award is awarded to persons who have demonstrated dedicated service to the International Door Association as a volunteer. %JTUJOHVJTIFE 4FSWJDF "XBSE The award is for an individual who is an innovative leader, with high integrity, honesty, quality oriented, and who has made a tangible/intangible contribution to the door and access systems industry. %PPS 5FDIOJDJBO PG UIF :FBS "XBSE This award recognizes an individual who is employed as a door and access systems technician employed by an IDA dealer member. Criteria includes: minimum of five years tenure in industry, model technician, highly skilled in multiple industry products. *OEVTUSZ .FNCFS 4FSWJDF "XBSE The award honors an IDA Industry Member for its continued excellence in operating its business, for significant contribution to the IDA, for overall industry and product innovations, and for displaying exceptional traits of honesty, integrity and quality. -JGFUJNF )POPSBSZ .FNCFS "XBSE This award is for IDA members who have devoted a lifetime career in the door and access systems industry, and who were active members upon their retirement. 66 International Door & Operator Industry™ )FSJUBHF "XBSE This award was established to recognize individuals who have contributed to the well being and heritage of the door and access systems industry typically through more than one generation. )VNBOJUBSJBO "XBSE This IDA award recognizes an individual or company that has contributed significantly to a humanitarian need. 5BODJM " )PSOF $IBSJUZ "XBSE This award is actually a financial contribution to a deserving Charity. Criteria: non-profit charitable organization that represents philanthropic and community service traits of the association.